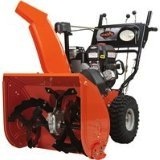 The Ariens Platinum 24 Snow Blower is also commonly known as the Ariens Platinum ST24DLE snow thrower. This machine is incredibly well designed to last a long time. It even comes with a 3 year warranty, so you can be sure that it’s a quality product. The Ariens ST24DLE is powered by a Briggs and Stratton built 1150 series Polar Force engine. It has a displacement of 0.25 liters and has been designed to start even when it’s well below freezing. Like all Ariens snowblowers, the the ST24DLE has a choice of either a pull cord start using a recoil mechanism or it can be started via the mains electricity. The clearing width of the machine is obviously 0.6 m (or 24 inches). It has a clearing height of 0.53 m (21 inches) but thanks to it’s robust design, it can tackle drifts that are deeper than this. This is a dual stage snow blower that uses both an auger and an impeller to break up the snow and send it up to 15.24 m (50 feet) away from the clearing area. The auger on the Ariens Platinum ST24DLE Snow Blower is crafted from steel and has a diameter of 0.36 m (14 inches), while the impeller also has a diameter of 0.36 m (14 inches) and consists of 3 blades which force the snow up the chute and away from the clearing area. If you are looking for similar models of snow blower to the Ariens Platinum ST24DLE Snow Blower, then you should check out the Ariens Compact 24 Snow Blower or the battery powered Ariens AMP 24 Snow Blower. While these machines have the same clearing width as the ST24DLE, they aren’t built as robustly as them and as such can’t handle as much snow as the ST24DLE. Click Here to buy the Ariens Platinum 24 Snow Blower.